L 40-51 cm (of which tail 20-30). Breeds commonly around farms and villages wherever there are a few trees and often also patches of short-cropped grass or bare ground; also common in urban areas. Thus associated with proximity of man, which gives advantage of ready supply of food and reasonable protection against predators. Resident. At times gathers in noisy flocks of 5-25 birds, known as magpie parliaments, and in winter may roost in even larger flocks. Sounds the alarm against cats. Vigilant but not timid, swoops down and patrols lawns and flower beds in centre of noisy cities in search of worms, insects or food remains. Has false reputation of being a silver thief. Builds roofed stick nest in tree crown (looks like large witch’s broom). 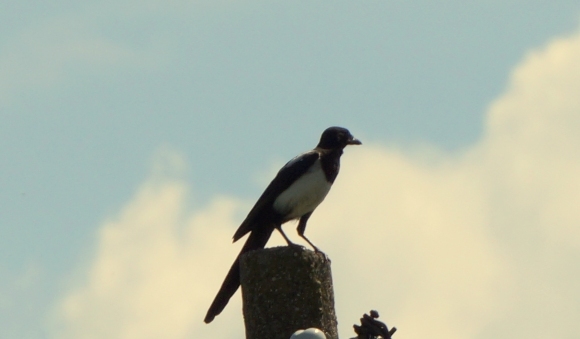 IDENTIFICATION: Unmistakable - probably the bird which most people recognize. Black and white, with very long, green-glossed tail. In flight, short, rounded wings show large white panels on ‘hand’. Flight fluttering, on straight course, with occasional sweeping glides, sometimes from high rooftop right down to ground. Walks confidently and slightly jerkily with tail often raised, also makes strong bounds. VOICE: Most calls are hoarse and unmusical. Perhaps best known is the alarm-call against cat or owl, long-drawn-out, fast, very hoarse staccato series, ‘tsche-tsche-tsche-tsche-tsche...’. Other calls rather varied, usually hard, hoarse and whining sounds mixed together; disyllabic, clicking ‘chaka!’, ‘chiah-cha’ etc. in conversation. Song more rarely heard, a quiet, harsh twittering ‘subsong’.